Too often, history seems to focus on the wars and larger conflicts; it’s perhaps even more important to see art representing the personal-scale conflicts and the edges of lesser-discussed lives. My guests today are Tyson and Andrea, two of the students in a senior drama clash and actors in Theatre UNB’s last production of the year, A Patriot For Me. 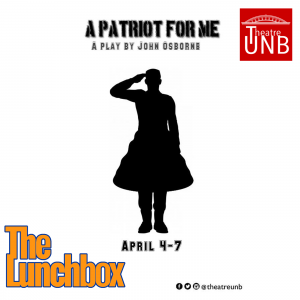 We discuss their roles in this unusual and vibrant historical play, including how the play sheds a different perspective on a time we have our typical ideas about. « CHSR brings you the U Sports Men’s Nationals Hockey Tournament!